We have some exciting news to share – we have just introduced our next generation Digital Temperature & Humidity Sensor, with a newly redesigned and improved enclosure cap! The newly designed sensor began shipping on 25’ length orders on December 7, 2018 and the longer lengths will soon follow. Various new cap design options have been tested extensively for almost a year, with very positive results. The internal components of the sensor have remained the same, and the new honeycomb sensor cap design helps to promote increased air circulation around those internal sensing components. Increased air circulation means faster response to changing air conditions. Earlier this year we published an article with some information about independent lab testing that was conducted on many of our sensors. Those tests proved the accuracy of our sensors in a controlled environment, although one aspect of the testing that stood out to us was the responsiveness of our sensors to rapidly changing conditions. 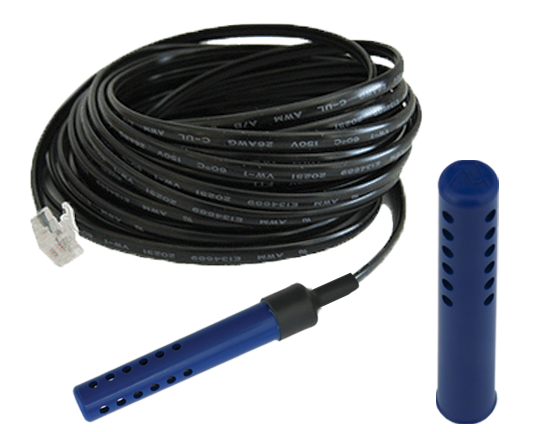 Our Digital Temperature & Humidity Sensor is our most popular sensor, and for good reason. That one sensor reports on four different factors for users: Temperature, Humidity, Heat Index, and Dew Point. The accuracy in the testing sessions proved out the internal sensor components on those four factors, however testing indicated that responsiveness to rapidly changing conditions could be improved with a different cap design. Those results led our engineering team to develop a number of different caps for the Temperature & Humidity Sensor, which we 3D printed internally to assess the design and effectiveness. The cap designs that performed the best were then sent out to be manufactured in the facility that makes our current caps and were then tested head to head in a production environment. With the newly-designed caps in house, our initial test results were reinforced, especially when testing against the previous cap design. The new honeycomb cap design offered the fastest response to changes, which then led to an even greater accuracy in readings. 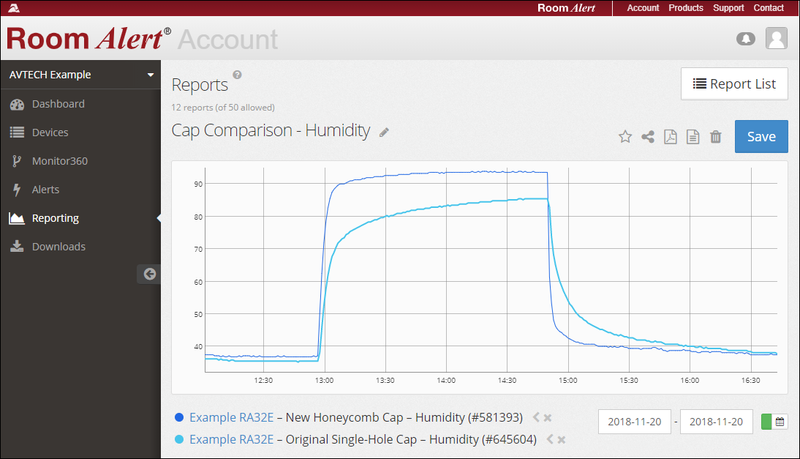 Our support group put together a full Frequently Asked Question about the new Temperature & Humidity Sensor cap design, which you can read here. 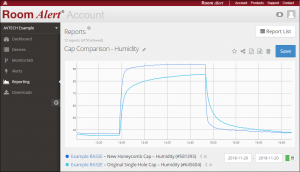 The FAQ is full of graphs and readings showing the differences between the old and new sensor cap designs, with both temperature and humidity readings. The entire AVTECH team is committed to providing Room Alert products that are market leaders when it comes to proactive environment monitoring. Our users trust Room Alert to protect their most critical and important assets, and we have a duty to ensure all our products operate at the highest levels. It was important to us to immediately act upon the chance to improve the Temperature & Humidity Sensor as soon as independent testing showed there was room for improvement. It’s also a credit to our engineering, support, and quality assurance teams here at AVTECH – they worked diligently on various designs to make sure the final new cap design was the one that showed the most improvements and will help our users better protect their facilities. If you are currently using the solid cap design Temperature & Humidity Sensor to help protect your facility against environment-related downtime, you can continue to do so with confidence that the readings are accurate. The new sensor cap primarily improves on the sensor’s ability to more quickly respond to rapidly changing humidity conditions. If you’d like to replace them with the newer design, please reach out to your dedicated Sr. Product Specialist. We will be happy to work with you on a cost-effective plan to upgrade the solid cap sensors with the new design to help better protect your facility. Our team is hard at work on some additional product redesigns as well as new offerings as we head into 2019; we will continue to offer the best products to help ensure business continuity for organizations small and large. Keep an eye on this space, as we’ll be sure to share news on new releases as soon as they’re available.